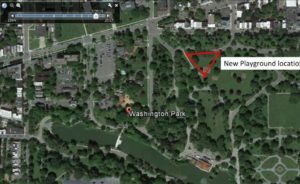 Albany’s historic Washington Park needs a new playground! From tulips in the spring to leaf peeping in the fall, Washington Park is one of the most popular attractions in the city of Albany. This beloved gem of the city park system serves not just Albany residents, but visitors who come from far and wide to enjoy this historic park. For families with children, the Washington Park playground, located on the northern edge of the park, is particularly popular. But the playground simply does not meet the needs of a bustling park in the heart of downtown Albany. The current equipment is inadequate, unsafe in some cases, and not accessible or developmentally appropriate in others. The playground also lacks fencing or a boundary, which makes safe supervision of a child or groups of children a challenge, and seating is inadequate. The Washington Park Conservancy has begun the process of engaging community stakeholders and the City of Albany to plan a new playground that will serve the diverse users of the park. Our goal is to rebuild a new playground in Washington Park that will offer a safe, engaging and accessible space in which children of all abilities have the opportunity to enjoy inclusive play. Accessible recreation facilities are key elements of strong, safe, family-friendly communities and help to give a neighborhood an identity. Neighborhoods that surround the park, nearby businesses and organizations will also benefit from a new playground as will the many groups that use the park for meet-ups, birthday parties, church picnics, and summer camp visits. We are envisioning a five- phase process for this endeavor, over the next 2-3 years. We are currently in Phase One, and welcome your input and involvement in this project! Phase One: Planning and Design– Led by the Washington Park Conservancy & Playground Rebuild Committee This planning will involve inviting many voices to the table and soliciting community feedback to ensure the resulting playground accommodates the needs of the next generation of children to play in Washington Park. Phase Two: Fundraising and Community Engagement – Fundraising, generating public awareness ,and building support for the project through community meetings and events. Phase Three: Construction- Working with the City of Albany Recreation Department and Department of General Services, old playground structures will be removed or relocated. Groundwork needs to be complete in order for structures to be set in place. Phase Four: Completion – A Ribbon Cutting will welcome the community to the playground and provide an opportunity to publicly thank the supporters of the project. We have an ambitious goal of completion in spring 2021, as part of Washington Park’s Sesquicentennial Year Celebration. Phase Five: Ongoing Maintenance- The City of Albany Recreation Department and Department of General Services will maintain the new playground. It is anticipated to need minimal upkeep, as it will be designed to withstand the elements of Albany and durable to the effects of play.